Strange fish washed up on North Carolina beach. 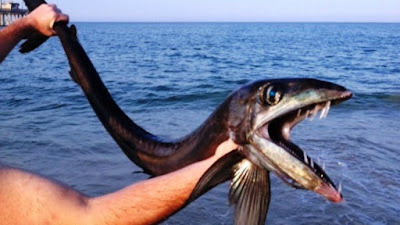 NAGS HEAD, N.C. – A rarely seen deep sea fish washed up on the beaches of North Carolina on Monday evening. A Lancetfish was found in Nags Head on a beach south of Jennette’s Pier. It is an open ocean fish and rarely comes to shore. Lancetfishes have large mouths and very sharp teeth. They grow up to 6.6 feet in length. Very little is known about their biology, though they are widely distributed in all oceans, except the polar seas. Officials with Jennette’s Pier say the rare fish was alive when it washed up on the shore. Daryl Law, who works at the North Carolina Aquarium, said the fish was released after being photographed. Lancetfishes have been seen as far north as Greenland and are often caught by vessels long-lining for tuna.